Oh boy, my library will be getting bigger soon. I just found this in the De Smet newsletter. Almanzo Wilder is going west-all the way to the bustling town of Spring Valley, Minnesota. But the pioneer life isn’t quite what Almanzo expected, and he can’t help but wonder: Do the Wilders belong back east in New York? First introduced in Farmer Boy, Almanzo went on to become a charming gentleman who won Laura’s heart in The Long Winter, Little Town on the Prairie, These Happy Golden Years, and The First Four Years. Now Readers will get to know him as a spirited young boy about to embark on his own adventures. I think I'll add this book to my Wilder collection. It sounds really, but really good. I wanted to read more about little Manzo, big brother Royal, sweet little Alice and big bossy sister Eliza Jane. P.S: I wonder if baby Perley Day appears in this new book. I'll definitely be on the lookout for this one. Thanks for letting us know, Marilyn. Let us know how you like it. Farmer Boy was one of my favorites. Not at my library. I search at the library online. Ok, I got my copy from Amazon a week ago or so. I started the first chapter but stopped because I am reading Farmer Boy at the moment and it just didn't seem right to read him at 2 different ages. I am ready to read it now tho, does anyone else have a copy? (Cheryl, I know yours is coming) Maybe we could do a readalong and take turns reviewing the chapters. I left you a message on Facebook, but I'll respond here too. Mine should be here by the end of next week. Maybe sooner if all works out well. I'll be up to reading once it comes in. Loving this book so far. Has anyone else read it? No, I haven't read it, yet. We are reviewing this book at another site. I don't mind sharing the chapter reviews over here if anyone is interested in reading them. I also found a site called good reads. If, theirs a new book out there. That everyone is talking about. You can read the reviews. If, you think, it's going be a really good book to read. Then, you can buy or borrow form the library. They have goals. Like, you can set, how many books, you want read for 2012. You star the books. From 1-5 1 being the worst and 5 being the best. Ok, I will post chapter 1 later on tonight's when I get back to my pc. I have made a new thread for the chapter reviews and posted chapter one. 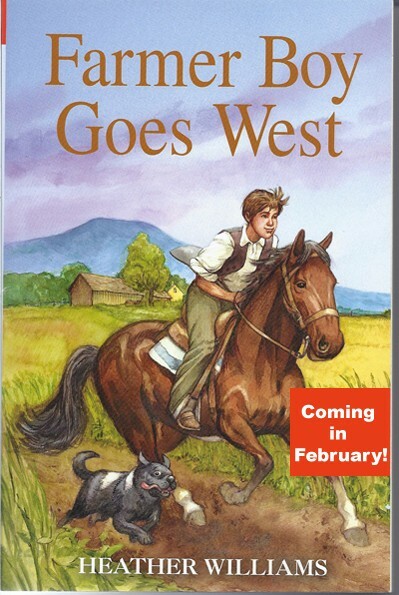 Recently at the library I found a copy of the book "Farmer Boy Goes West", which is like a continuation of the book "Farmer Boy," by Laura Ingalls Wilder. Though Farmer Boy Goes West was not written by Laura, it is still very realistic and picks up soon after Farmer Boy ended. The story is about when Almanzo and his family moved west from New York to Minnesota. I was wondering if anyone else had read this book? Because before I found it at the library I hadn't even heard of it before. But I reccomend it! Chapter Reviews for this book can be found on this forum here.